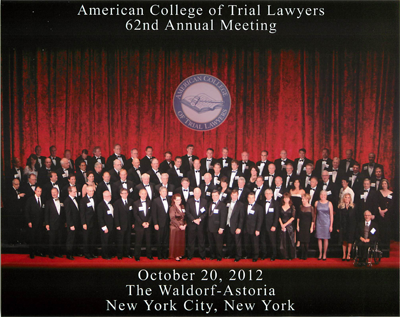 The induction ceremony took place recently before an audience of approximately 1,070 persons during the recent 2012 Annual Meeting of the College in New York, New York.Membership in the College cannot exceed one percent of the total lawyer population of any state or province. There are currently approximately 5,838 members in the United States and Canada, including active Fellows, Emeritus Fellows, Judicial Fellows and Honorary Fellows. The College strives to improve and elevate the standards of trial practice, the administration of justice and the ethics of the trial profession. Qualified lawyers are called to Fellowship in the College from all branches of trial practice. The college is thus able to speak with a balanced voice on important issues affecting the legal profession and the administration of justice. To commemorate this special day, a photograph was taken during the induction ceremony. https://www.mccarthyco.ca/wp-content/uploads/Martha-McCarthy-Family-Lawyers-Logo.png 0 0 Martha McCarthy LLP https://www.mccarthyco.ca/wp-content/uploads/Martha-McCarthy-Family-Lawyers-Logo.png Martha McCarthy LLP2012-11-28 03:36:362019-01-19 03:35:49Martha McCarthy has become a Fellow of the American College of Trial Lawyers, one of the premier associations in America.